A short day at 12 miles. While it was pretty cool early I had to climb for the first four miles and I was feeling the effects of long miles yesterday. In other words I was tired when I started. Not the best way to start the day but I figured I'd just move along at a steady pace, take breaks and enjoy the music on my MP3 player. My friend Janet put a bunch of good, energetic music on a memory card for me and that really helps. I can sing along and stop thinking about my discomfort. 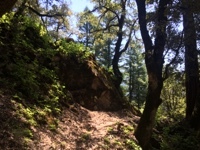 To top it off the trail was way overgrown and I had to push myself through in some places, hoping not to be exposed to too much poison oak in the process. I met a bunch of interesting people today. The first guy, who was long and lanky, is from Switzerland and it sounds like he's doing 30-35 mile days. Then came Argentina who is an old hand at the PCT. He has attempted the PCT so many times that I lost count when he was telling me about it. Actually he told me that 15 years ago he started the trail "to die out there." Apparently he has a degenerative back condition and his docs told him in two years time he would be in a wheelchair and after that on a morphine drip. As he says it "I had other plans." So each year he is able do more miles...first 500, 600, then 900 miles a summer. Over the years he has gotten stronger and has been able to do more miles with less pain. Pretty amazing if you ask me. After that I saw a guy with an impossibly small pack, jogging the trail. What? Two more guys moving fast then I took my lunch break after 8 miles. As I was pulling into the clearing a guy was doing the same, from the south. Then a young couple joined us and I got to listen to all the trail Intel, or gossip if that's how you want to look at it. Apparently there a couple of folks hiking the trail with two goats. I can't wait to meet them! 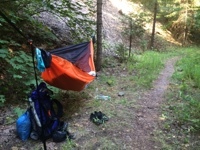 As I pulled into Fitzhugh Gulch Creek there were supposed to be two campsites. The first one coming in was treeless and the second one, that did have perfectly placed trees, had a tent smack dab in the middle of it. It was only about 1:30pm and this person had gotten to camp even before me! She was kind and said I could share her spot but that wasn't gonna work so I looked for another spot near by. I have a lovely hang, four feet from the trail! Oh well, what can you do when hiking in narrow canyons with steep slopes? Amy, or Second Life as she is called, is section hiking and is doing fewer miles than some. She works for a Tahoe based state agency so she can't take too many days off at a time. She says she is on the 25 year plan for finishing the PCT. Day two down and four more to go for this section. I've got some short days planed, and some long days ahead, mostly due to terrain. Fingers crossed!